CURTIS, Neb. — Aggie students are joining cattle producers and industry leaders as members of Nebraska's largest beef industry organization. 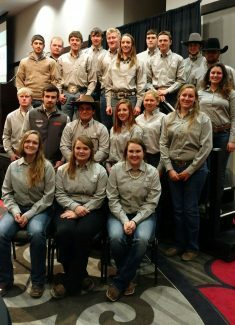 Animal science students at the Nebraska College of Technical Agriculture in Curtis recently attended the Nebraska Cattlemen convention in Kearney. There, the NCTA Collegiate Cattlemen club members participated in educational forums such as the Cattlemen's College, said Terri Jo Bek, NCTA animal science professor and Collegiate Cattlemen faculty sponsor. "We think it is important for our NCTA students to be involved as industry partners with peers and mentors in beef cattle production," Bek said. Twenty NCTA students attended the Kearney meetings. "These young adults learn a great deal by interacting with other producers, learning issues more in-depth, meeting potential ranch employers, and sharing their ideas about legislative proposals that will affect their own beginning businesses," said Bek, who recently retired after 39 years at NCTA teaching animal science including feedlot management and veterinary technology. She and Dave Smith, retired department chair, oversaw formation of a student chapter of Nebraska Cattlemen. Several livestock management students approached her in 1999 about creating a campus affiliate. The NCTA Collegiate Cattlemen's Club, the first collegiate affiliate in the state, was chartered in January, 2000. Bek has been a three-time recipient of the Nebraska Beef Industry Endowment Award presented by the NC Foundation. She has applied the monetary awards for animal science student support, her teaching programs and, in 2016, the NCTA Heifer Link program, which provides first-time cattle ownership to student recipients. The convention was an eye-opener for Cash Talamantez, an animal science major from Lisco, Neb., who served as the NCTA Collegiate Cattlemen president last year. "I had never been to the convention before so I was surprised to learn about some of the issues affecting so many segments of the industry," he said. Regulatory proposals such as restrictions on the hours of service for livestock transport carriers is one such concern, Talamantez said. After graduating next May, he has full-time employment waiting for him with a veterinary service at Bridgeport, where he also worked part-time while attending Bridgeport High School. He plans a career in the beef industry so while attending the Young Cattlemen's Conference Round Table at the convention, he signed up for a new NC student membership offer. Students, up to the age of 24, are eligible for policy voting privileges with a one-time dues payment of $25, said Melody Benjamin, NC vice president of membership. "This is a great way for young producers to have a voice in industry issues and join leadership programs," she said. Professor Doug Smith, chair of NCTA's Animal Science and Agricultural Education Division, is a member of the YCC Class of 2016. While attending the Round Table, eleven NCTA students registered for the membership offer and also applied for one YCC scholarship. One NCTA recipient will be named. Financial and leadership support from the NC Foundation has aided NCTA Livestock Judging Teams through the years, he said. And, the NCTA Animal Science program has entered a steer for the Foundation's Retail Steer Challenge for the past 12 years. Sale proceeds go to the foundation which annually sponsors college scholarships. Additionally, Smith has received the Nebraska Range and Conservation Endowment award from the group for two consecutive years. It furthers academic programs and industry seminars at NCTA, including an annual visit to the University of Nebraska Gudmunsen Sandhills Laboratory Field Day. "We are proud of our NCTA Aggies and know when they are able to begin their own herds individually or through their employment that they, too, will be active participants and leaders in Nebraska's industry," Smith said.